Passes for our 2018-19 Season are on sale now! Buy them here, or by calling the Box Office at 817-784-9378. Stage West features one of the most flexible season packages around. Use your season pass as you wish: See 6 shows with 1 ticket, or see 1 and bring 5 friends! Or 2 people can see 3 shows with 1 pass! You don't have to choose your date and seats in advance, unless you care to. A year’s worth of one-of-a-kind experiences. Get the best seat in the house! 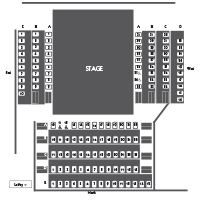 Priority seating for performances. Two for one admission on preview performances. Free admission to the New Play Readings Festival and the Festival of the Kid. Discounts on pre-show dining in the Lobby Café as well as on Stage West Theatre School classes for kids, adults and seniors. $3 discount on additional single tickets. Complete flexibility with dates and seating. As much as 27% in savings off single ticket prices. Each subscription comes with a free ticket to a Kitchen Dog Theater production. Yes, I want a Season Pass!